Lock in a great price for Retrome Urban Retreat – rated 9.2 by recent guests! The hotel was amazing! The staff was so helpful. Excellent central location. Rooms were great. It was my birthday on the trip and the staff even sent me a bottle of champagne. So nice! Would definitely recommend. The staff was friendly, helpful and welcoming. The little cafe, common area and room was stylish and had everything I needed. Staff was especially kind to make me a sandwich and cup of tea when I had to catch an early train. Amazing friendly staff. Unique personalized check-in process. We've gotten a free room upgrade! Nice interior design. Very cosy. Big smart TV. Big nice bathroom. The location of this hotel is perfect — you have all major sights within walking distance, but if you don't like walking there is a metro station just in one or two minutes. Stuff is very kind, friendly and helpful. Also they serve tasty breakfasts. Loved Retrome! The staff are superb! Kind and caring- I had my purse snatched and when the staff found out, each showed such genuine concern. They helped make a crappy situation a little better. Also the room was perfect, nice sized, great shower, little balcony. Had a front facing room which was a bit noisy at night with drunken people in the street. But hey, people are on vacay- party away! The hotel is well located, metro on the corner, eateries and a market nearby. Perfect! The location was fantastic. The staff was super friendly and helpful with everything. The rooms were very clean and the decor was exactly as pictured. The restaurant had a great breakfast every morning and was a great place to stop for a drink before going out to dinner. We loved everything about this hotel. Great place, cozy rooms and friendly staff. Centrally located and close to metro station. Very friendly staff. The room was neat and fun vintage. We had a little balcony over the street which was a delight. Great location, we walked to all the things we wanted to see. Great little place with a super comfortable bed and a nice little terrace balcony (which we didn't use because it was wet and cold!) Breakfast is the best part of this whole stay so you would want to make sure it's included in your rate and give yourself a good amount of time to enjoy all of the offerings! Light sleepers might want earplugs as you can hear people coming and going even if they are trying to be quiet. And there was a weird issue with the lift which made it sound like a trombone was being played to celebrate the passage between the first and second floor. Location was great for walking everywhere and super close to the metro if you prefer the subway. Less than half a mile from Passeig de Gràcia, Retrome Barcelona features spacious air-conditioned rooms with beautiful vintage décor, free Wi-Fi and tea and coffee-making facilities. 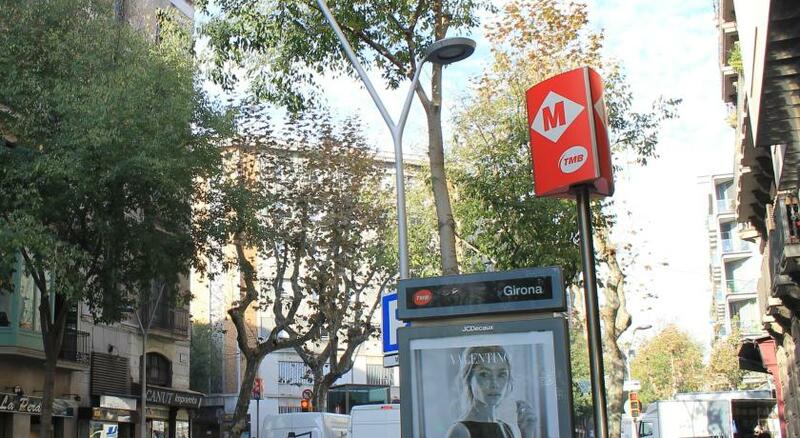 Girona Metro Station is a 1-minute walk away. Retrome’s individually decorated rooms feature interactive LED TVs with satellite channels. Some rooms have access to a patio or balcony. The stylish bathrooms feature a rain shower, hairdryer and toiletries. In the Eixample district, Retrome Barcelona is a 10-minute walk from the famous Gaudi buildings of Casa Batlló and La Pedrera. The beach is just 4 Metro stops away. Trains to Barcelona Airport stop at Passeig de Gracia Train Station, a 5-minute walk away. The staff at Retrome can also arrange airport transportation and provide information about the city. When would you like to stay at Retrome Urban Retreat? This spacious, air-conditioned room has beautiful vintage décor and a queen bed. It includes free Wi-Fi, an interactive LED TV with satellite channels and tea and coffee-making facilities. The stylish bathroom features a rain shower, hairdryer and toiletries. All rooms have access to a patio or balcony. This spacious, air-conditioned room has beautiful vintage décor, a queen bed and a sitting area with a double sofa bed. It includes free Wi-Fi, an interactive LED TV with satellite channels and tea and coffee-making facilities. The stylish bathroom features a rain shower, hairdryer and toiletries. This room also has a private balcony. House Rules Retrome Urban Retreat takes special requests – add in the next step! Retrome Urban Retreat accepts these cards and reserves the right to temporarily hold an amount prior to arrival. Please inform Retrome Urban Retreat of your expected arrival time in advance. You can use the Special Requests box when booking, or contact the property directly using the contact details in your confirmation. WOW, what a fun place to stay at. From the moment we arrived, the young at enthusiastic staff were super helpful and very professional. We were give a map and some great advice on how t get around and what to see. Our room was on level 2 and easily reached via an elevator. The room was spacious and well equipped including a coffee machine). Great location and walking distance from La Sgrada Familia (10-15 mins) and the Old Town (about 20-15 mins.) Thank you to all the staff for making our stay and enjoyable one. PS: Breakfast was fantastic. Great breakfast, great location, great room, great staff. What more could you need. Great and very friendly personal, clean room with balcony, cozy open area with coffee machine and fridge. Stylish interior. It was safe to leave our belongings in the room. Tasty breakfast and cool lounge in the evening. Metro station right across the street. I´m looking for a perfect place to stay in every city I visit and I don´t need to search anymore in Barcelona. Next time I will stay here again. The lovely welcome from everyone on the staff - couldn't have been improved upon and it's so important as it instantly makes you relax and feel at home. Thank you ! great hotel!!! very friendly staff! good location! The interior design, the friendly easy going vibe, the quiet room with balcony overlooking palm trees, the tea and coffe making facilities. Towels was a wear out and cleaning room was middle. The bed is just fine.